Here’s a quick note to recommend the ‘Pita Pocket‘ sandwich (seen above) at Cafe Turtle as a must-try. I will roll the caveat here – for those who are unaware, Cafe Turtle serves vegetarian food. There, that’s the big ‘gastro-mental’ hurdle to overcome. I usually find myself proximate to a Cafe Turtle only when I’m at the excellent Full Circle bookshop (which as a bookshop, is as omnivorous as they come). The last time around, I was not only near Cafe Turtle in the aforesaid manner, I was also near starvation. The ‘Pita Pocket’ appears near the bottom of the list of Mains at the cafe, and offers a pita bread filled with falafel, lettuce and tomato, with tzatziki dressing. The sandwich was indeed filled with the promised goodness – the bread warm, soft and crumbly crisp, with the lettuce and tomato inside still crunchy. The falafel (2 of them), made with cottage cheese and bulgur wheat (from the menu, not that I could tell while eating it) were warm, dense and melt-y. I would have loved some more of the delicious tzatziki – drizzled liberally as it was on the outside, there was none inside. While it helped preserve the integrity of the stuff inside the ‘pocket’, a bit of tzatziki on the side would only have helped. Maybe I should have asked? So once again, here’s the hero of the piece. Hungry as I was, as you can see, I was unable to take a shot of the full sandwich. And I had to quickly take this picture before my other hand reached out for a second bite. 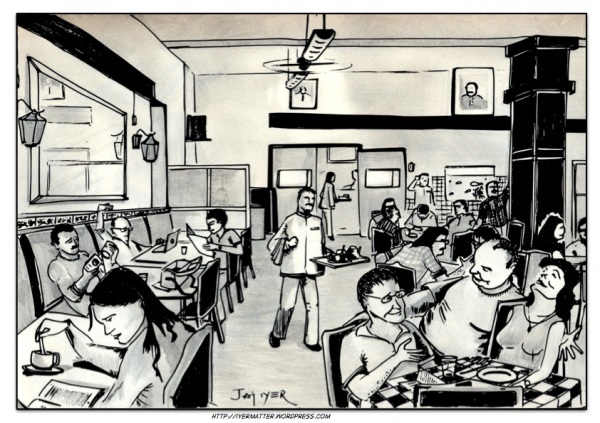 So, here I am – with the second instalment of iconic food joints across the country. There was a mild frisson of controversy over the first instalment (read it here) as the venerable JAP pointed out Mocambo had much better food than Peter Cat and a senior colleague was quite distressed that Gajalee hadn’t featured. Well, of course these two (and many others) serve out-of-the-world food but the point about icons is that they are not (necessarily) about food. It is about the legend. Which brings us to the first name in this list. A not-so-glitzy shop at the edge of the glitzy Park Street is known as The Golden Restaurant. The adjective probably refers to the golden hue of the rice and potato (Yes! Calcutta biriyanis have potatoes) that arrives in perfect heap on a gleaming white porcelain dish. The chicken biriyani would have one end of the chicken bone sticking out of the rice (to distinguish it from the mutton version, which is a plain heap of rice). I have never seen the biriyani remain on that dish for more than 9 minutes. Be it the democratic open area in the ground floor or the AC section on the mezzanine, people just jump the biriyani the moment it arrives. Of course, the rest of their fare is magical too. They have a sort-of-multi-layer-sweetish paratha (which is not really a lachha paratha) that – when served with their Chicken Chnaap – is a thing of beauty and a joy forever. While writing this post, I realised that I have never had kababs from Shiraz. I have gone through three-and-half decades of my life having tasted only 4 or 5 items of their menu! This is one place I was totally unimpressed by. When I was in Bangalore, I could not voice my opinion in the fear of being lynched (or being mistaken for a donkey and sacrificed!). But I am completely convinced about its status as a Bangalore icon. Its unobtrusive facade. The stern guy at the billing desk. The (waiting) coupon which always seems to have a number in excess of 400. And the queue seems to go on till the end of the universe. Even before you get a glimpse of their overloaded stainless steel thalis, MTR imposes its legend upon you. Their serving style is old-style Bangalore – suffused with a confident lethargy. They know you’ll wait. They also know the wait will be worth it. So, they stop to sniff the flowers before they let you sniff the sambhar! For people like me – used to inhale full plates of biriyani in 7 minutes – this art is lost but that is clearly my loss. This is clearly the one Bombay institution which divides the city right down the middle. Some people think it is over-hyped rubbish while others swear it is manna, dropped straight off carnivorous heaven. Without taking sides, I can safely say that any food that ignites such debate is an icon. All my brushes with Bade Miyan came immediately after a longish booze session at Gokul (which could well be an icon itself) next door. After finishing the liquor that is served rapidly and cheaply, the steps are a little unsteady when you come out but the hunger is beating a steady rhythm. It is in this state that everybody approaches Bade Miyan. Be it the cheap rum at Gokul or the swish wine at Indigo, this small nondescript shop is an island of protein in a sea of alcohol. And thanks to the inflammable nature of the liquid, Bade Miyan is never short of flying fists around it. A food joint where fights happen regularly. If that is not an icon, what is? While on the subject of violence and carnivores, read this post (and the comments with it). This is where Chiranjeevi comes for breakfast. Located at the triveni sangam of Banjara Hills, Jubilee Hills and Punjagutta, Chutney’s is just another restaurant serving dosas, idlis, uttapams and pesarattus to hungry souls. But their Baba Hotel Idli – oh god! Or their MLA Pesarattu… don’t ask me why it is so named. I just thought its because it is as thick-skinned and oily as a MLA! Like Swagath in Delhi tries to do a Chinese gig to increase menu pages, Chutney’s also thulps in some North Indian delicacies. But I don’t think they ever get any orders of those as people just jump on to the 70 mm Dosa and all will be well with the world. The wait. The massive menu. The four pages of desserts. The walls jam-packed with Hollywood posters.And the blueberry cheese cake. The Big Chill serves a mixed menu that draws laughter from critics when it wins prizes for Best Italian at food awards but that’s because that’s the best category they fit in. Otherwise, what prize can you give them. Best Place To Take Girlfriend On First Date award? Or Desserts That Blow Your Mind, Diet and Wallet Award? In a strange inversion of the demand-supply laws, Big Chill seems to increase demand in Delhi as it increases supply. Every outlet they have opened in Delhi have got jam-packed within 17 minutes of opening the shutters. There are many places in Delhi that serve better Italian food and are quite reasonable too. But nobody packs it in like BC. And that’s one hell of an iconic queue! 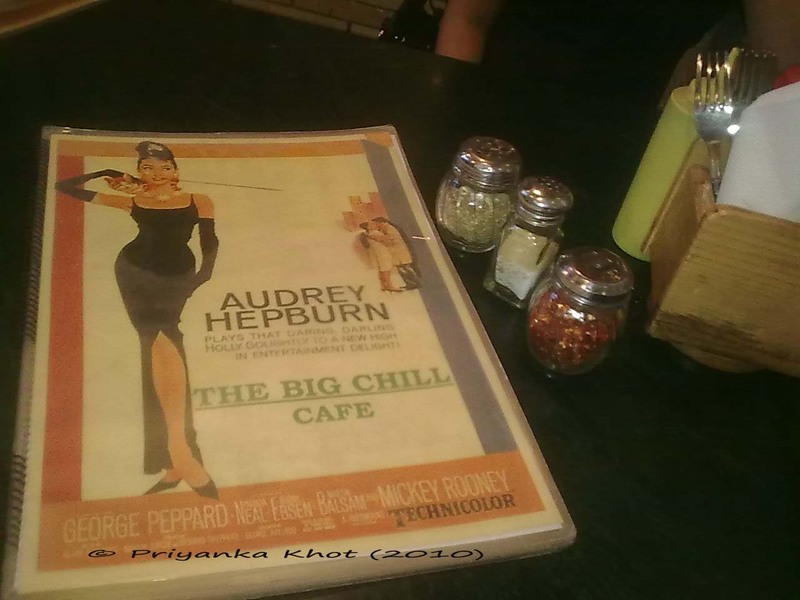 BTW, have you ever been to Big Chill and got to sit straight away? Yes? Hi Rahul. Hi Priyanka. 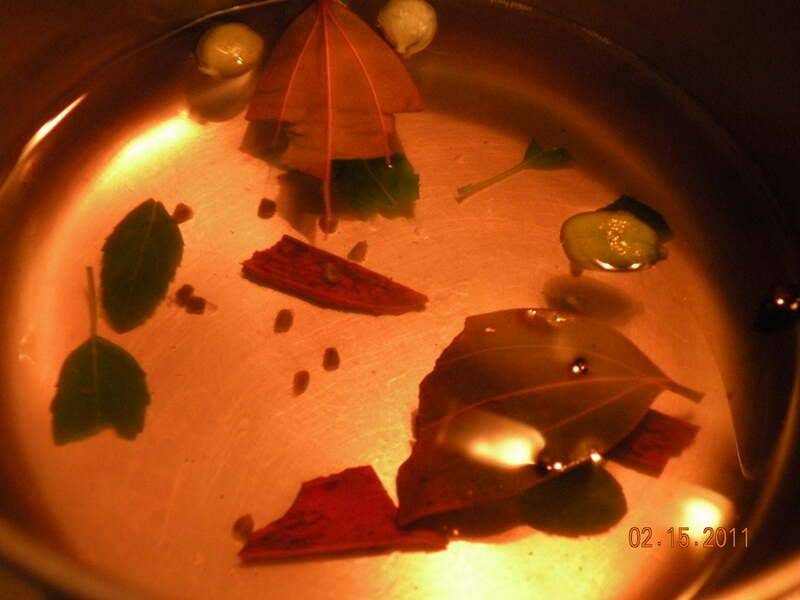 And so I decided to use some of the other stuff I’ve come across during my travails as a market researcher into homes of consumers across the country… so Bay leaf was something I picked up and tried… frankly, couldn’t tell if it was contributing much. So next peppercorns went in next… I had heard they are also very good for a cold… makes sense that they loosen up congestion, so I said why not! It did add a nice sting (but be careful… one day I put too much, and burned my mouth with the lethal pepper amounts), but not recommended for sore throats. 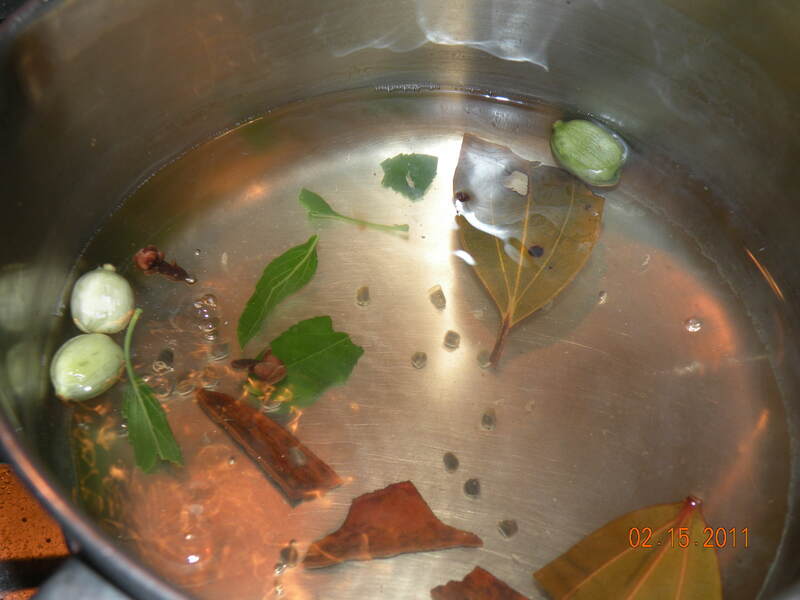 Clove was what I tried next. It’s supposed to be good for adding heat in our system, acc. to Ayurveda. Check. Approved. Elaichi (cardamom) is my old favourite, so that goes in too. Also tried was cinnamon… using it with cakes and in sweet preparations, I knew it was sweet, but the aroma of it in tea is quite incredible… try it! I think it’s a fantastic topic… and the list of foods made me really think of some very basic stuff that we‘ve all grown up on, that now gives us the emotional comfort. A hark back on our carefree days when eating and playing was mostly what we did! And makes us think of our Moms and Dads, siblings, good times, picnics, falling sick and getting well again…. And also a reminder that we needn’t fuss with our kids too much… they should also have some simple home-made foods and some junk to be a part of what they look back on. Toasted bread soaked in yummy butter is my fav too… i rem being sick, this is all i could eat! a nice veg soup, with butter swimming on the top and fried bread! aloo gobhi with lots of dhania with a crunchy paratha… yumm! non toasted white bread with butter… reminds me of childhood… crispy aloo chat – delhi style! Desi chowmein! Pakoda and chai! Arhar ki daal and chawal! Cheese omelette with buttered toast! Every city has a few iconic places to eat – restaurant being too pretentious a term for some of them – that are part of the city’s social and cultural history. It is not only about the food they serve – which is usually fantastic – but about the ambience and quirks of the place. Somehow, these have become part of the image of the place, adding to the legend. For all of them, the aura is as important as the menu. Many of them have been described as over-rated by non-regulars. There have been complaints of poor service. That is again part of their charm. Old-timers, wanting to keep the riff-raff out of their favourite adda, even tacitly support this! This post is the first in (hopefully) a series in which I try to recount my experiences at these places. I love the way they put a t able cloth when you order a beer. I love the way old-timers refuse to sit in the AC section. When I asked a friend why he didn’t want to sit inside, he said “That is not Koshy’s. That is Jewel Box. Koshy is out here.” I love their Brain Masala. Of course, I have been repeatedly told I should always be ordering the steak at Koshy’s. Its location – at the cusp of St Marks Road and MG Road – is as iconic. When I was in Bangalore, there used to be a night-club called 180 Proof (now Hard Rock Café) just ahead. I remember clearly a discussion I overheard at Koshy’s on the meaning of 180 proof and whether absinthe was 180 proof alcohol. It was as if I was back in Calcutta. How better can I compliment a place? Bombay – Britannia & Co.
Any restaurant which shuts on Sundays and opens for only 4 hours on other days gets undying admiration from Bengalis. I mean, the bugger doesn’t care about money and only about the quality of the food. Wah wah – one more Caramel Custard, please. The red-check table cloth. The chatty owner shuffling from table to table. The bow-tied waiters. 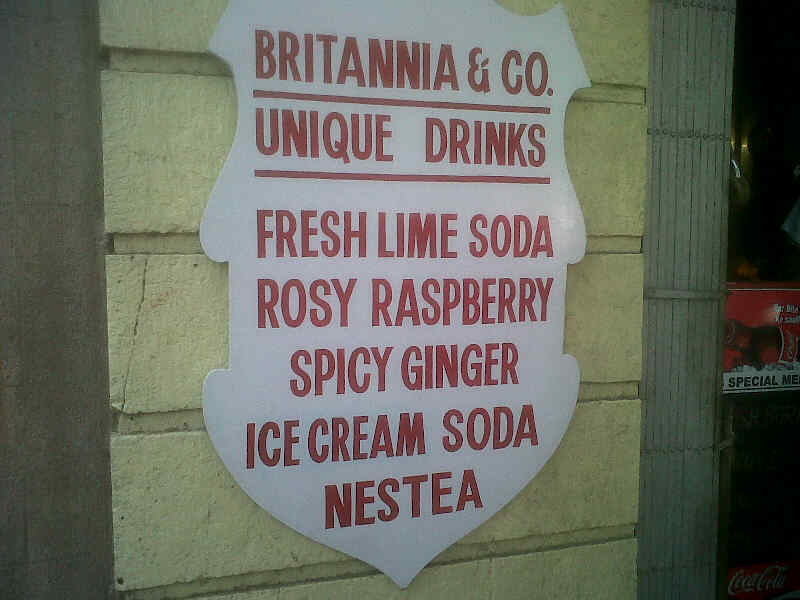 Even the hideous-tasting ‘unique drinks’ are part of the Britannia lore. It is a small matter that the legend was started by Berry Pulao and the Dhansak – which are quite fantastic. I had lunch there again yesterday – after a gap of nearly five years – I was a little apprehensive whether I would like it as much as I did the first time. I needn’t have worried. From the first spoon of the Pulao to the last mouthful of Caramel Custard, it was beautiful. The warm sun outside, the patience of the waiting crowd and the sleepiness of Ballard Estate on a Saturday were all just as beautiful too. Did I tell you that their Sali Boti is even better than their Berry Pulao? Well, try it and tell me if you agree. Very few restaurants – actively or passively – discourage mobile phone conversations nowadays. Peter Cat not only puts a tent card requesting patrons not to speak on the mobile phone, the stewards walk up and whisper polite warnings if you do speak! Peter Cat is all about legend. As I had written some time back, an overwhelmingly large number of Calcuttans have been to Peter Cat after their first salary and that is a sentimental high no other gastronomical creation can match. 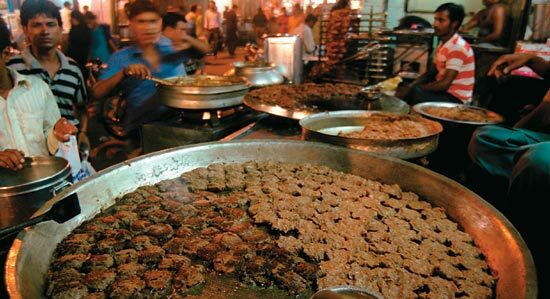 And their iconic dish – Chelo Kabab. 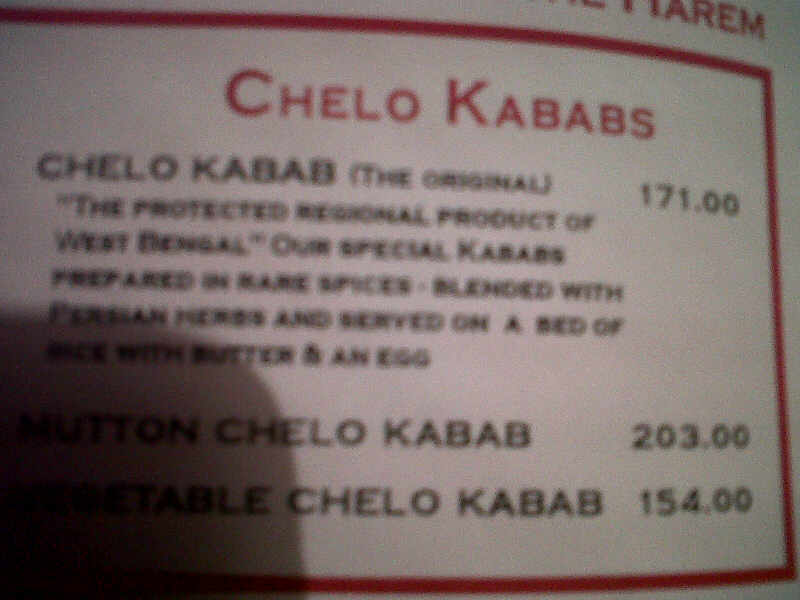 No single dish in any restaurant in the world would form such a large part of the total orders as Chelo Kabab does in Peter Cat. It is currently described in their menu as ‘the protected regional product of West Bengal, our special kababs prepared in rare spices blended with Persian herbs and served on a bed of rice with butter and an egg’. Whoa! When I was in Peter Cat last, I took a picture of the menu with my mobile phone camera. As I took out the phone, the steward frowned and started towards me. When I pointed the camera at the menu, he smiled and turned away. Must be happening a lot in there! There is nothing left to say about Karim’s that Lonely Planet, HT City Eating Out Guide or Time magazine hasn’t said already. Except that contrary to popular belief, the restaurant did not start in Bahadur Shah Zafar’s time. The descendants of the Mughal emperor’s chefs started the restaurant in 1913 (CENTENARY ALERT!!) and has been serving soul-stirring food ever since. Which means no other restaurant in the world is probably as Mughlai as Karim’s. Part of Karim’s charm is, I think, the inaccessibility. Jama Masjid and Nizamuddin, I can understand. Even their Malaviya Nagar outlet is particularly bad for turning and parking. I guess you feel the food better when you work hard for it. I don’t know if there is any one dish that Karim’s is really famous for because I manage to forget every item I order by the time I visit next. Actually, I forget the dishes by the time I walk out of the restaurant. All that remains is a whirl of meat, ghee and spices that tend to engulf one’s senses. In fact on the way out, I manage to lose myself in the bylanes as well. How does the second left matter after Chicken Jahangiri? How many places in the world do you know where a street or a square is named after a restaurant located there? Paradise Circle is the only one place I know of. For those who think biriyani is paradise, Paradise is biriyani. In a city known for biriyani, they have taken it to a different level altogether. Actually they have taken it to three different levels altogether – the air-conditioned section upstairs, non-AC downstairs and the terrace outside! Their chicken-mutton mixed biriyani is an innovation that deserves a Nobel Prize – either Chemistry or Peace. And their take-away section deserves one in Economics – for the most efficient revenue generation. Their hermetically sealed packages of biriyani and kabab are handed over in one smooth motion after the money is handed over and you are back in your waiting cab even before the ignition is switched off. Visits to Hyderabad are incomplete without a sealed packet of Paradise in your hand baggage. Don’t tell me you’ve not done it even once! They have opened branches in malls of Lucknow and Delhi. And yet, their original shop hidden in the labyrinth of Aminabad remains the touchstone of all carnivores. I had written about it once earlier and haven’t eaten there recently to add on that. Except that I’d give anything to eat there right now.